Please select the size skip you require from the list below. Please choose an area nearest to you from the list below. If your skip is to be placed on the public highway you will need a permit (with four working days notice). Grass verges outside your property count as on-road deliveries. Driveways do not. Remember that skips on the road will require lights and cones - we can supply and advise on numbers and layout. If you are in any doubt we will visit the site to advise. 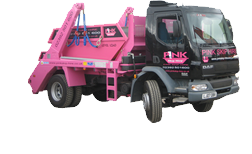 Pink Skip Hire is a privately owned company with a fully licensed waste transfer and recycling facility. With over 30 years experience our family run business provides a full range of skips, roll-on roll-off containers and enclosed containers for hazardous waste. Operating from our purpose built offices and waste processing centre in Hampshire, we offer a complete domestic and commercial waste management and recycling service to customers in Southampton, Portsmouth and the surrounding area and is a trading division of TJ Waste & Recycling. Skip hire to commercial and domestic customers. Waste transfer, removal and recycling. Level loads only (charges will apply if the skip is overloaded). No fires, asbestos, fridges, gas bottles, tyres or plasterboard to be placed in the skip. (charges will apply if these items are in the skip) if you have these items and wish to dispose of them please speak to the office. We cannot guarantee collection dates. If your order is cancelled on the requested day of service, a £35.00 cancellation fee will be chargeable. We accept no liability whatsoever for damage caused if the customer(s) ask for the skip to be taken off the public highway.